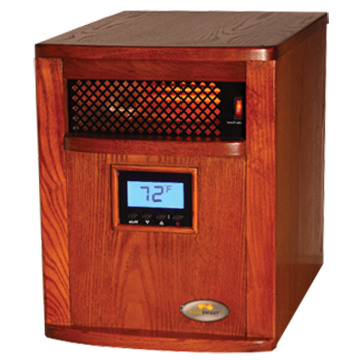 Reduce your heating bill throughout the cold months with the efficiency of the Victory infrared heater by Heat Smart? !Simply turn on this beautiful unit, select the perfect temperature, and heat the rooms you use for a fraction of the price. In fact, reducing (or not increasing) the temperature on your thermostat by a mere three (3) degrees can shave as much as 10% off your heating bill. With our patented Opti-Switch technology, we give you control over your heating bill by letting you decide how much energy you use. Additionally, the Victory also allows you to heat your home more effectively. Each unit uses a convection-style heating chamber to continually heat the air in your home gently so as not to eliminate moisture. Maintaining moisture allows our heaters to deliver longer lasting heat with therapeutic qualities. Simply put, no other method of heating can deliver the effectiveness and efficiency of a zoned heating approach. So, buy the Victory today and stop heating your home the expensive way and begin heating your home the Heat Smart?way!